AWS Outage: let’s learn a lesson to improve all cloud industry! It’s the second day of (partial) outage of AWS, see; was it so bad? if you look at the Service Health Dashboard it seems a little red in a green pasture! Well, for some perceived-mission-critical-services it has been a problem; for the blogosphere it’s become a topic to munch. Yo startups, understand better what you look for, how to plan for it, what level of information does Amazon need to provide you if they wish to be in business! And for Amazon: transparent communications are part of the SLA…. Crowdsourcing the crystal bowl: what big news in the Seattle IT industry? I do not have a crystal bowl, right? So it is fun to see when other smart guys meet and read theirs, at least from a statistical perspective something they say will come true! Read this article about the last Washington Technology Industry Association gathering, where predictions were asked and provided. PS Harry elaborates better than this only comment! Of course it is true that only between 17% and 28% of people living in urban areas already own a smartphone, and that is a big but negligible number. And yes, WP7 is appealing to late adopters, not to overturn iPhone or Android lovers. And yes, Microsoft has a true story of getting it right, eventually (usually on its third release?). Now that they have cracked the UI, getting something that people can use, and are at least on par in the operators commitment, we’ll see if the apps (eg the developers, the ISV communities) will start increasing the overall value of the platform. There was a number of issues that deserve a lifetime each (is the cloud the right strategic bet for Microsoft; why is the stock so flat; is it the time to breakup Microsoft), some interesting pointed answers from Bill, and to wrap the mood I like the comment from Sharon Pian Chian: “What used to be a love fest for Microsoft has turned into the nitpicking of a long-married couple”- UGH… [read her article for some more color]. Steve was deep in justifying the company strategy, why the bet on the cloud is the right one, why the synergies within the company enable new strategic growth in all areas. Bill’s corner: a guy asked him why he was selling his shares and donating proceeds to the Bill & Melinda Gates Foundation [instead of removing his shares from the corporate balance sheet to boost the stock price], his answer was: "I think the point of the question is, ‘Are the current grantees of the foundation more deserving than turning the money over to Microsoft shareholders?’ I guess I’ve made the decision that that wealth is going to go to the foundation…." Good answer Bill, but you may want to ask yourself if the Foundation is using that money more efficiently than the development Microsoft could bring to the Third World (that is, if you devoted more time to fix Microsoft, and Microsoft developed better programs for developing countries/weak social segments/developed research in healthcare). “Now isn’t the time to break up Microsoft. But it is time for Microsoft executives to decide what the company will be. The cloud strategy is pulling away from an older software distribution strategy that is antiquated in the cloud-connected device era. Applications will remain important, but they will be lighter than bloaters like Office. His comment is deeply connected to the partner strategy, that in my mind has shaped Microsoft and still constitutes one of its strategic pillars – but is there now a cloud partner strategy? well, not really, or better not yet, or not that partners understand anyway. And, if there was a cloud partner strategy, is it enabling Microsoft to be as successful on the cloud as it was on prem? Gamization is one of the “must do” trends in internet & apps market – add a “social gaming UI” to entice users to use your app, entertain them as you address them. The new research from Flurry now says that on the iOS (the only media platform that already enables in-prod ecommerce) micro-transactions generate 1.6B US$ this year, more than advertising; and it’s growing. 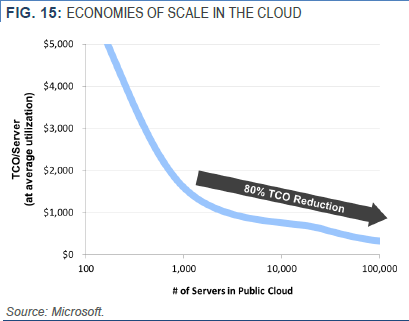 Our analysis uncovers economies of scale for cloud that are much greater than commonly thought. We believe that large clouds could one day deliver computing power at up to 80% lower cost than small clouds. This is due to the combined effects of three factors: supply-side economies of scale which allow large clouds to purchase and operate infrastructure cheaper; demand-side economies of scale which allow large clouds to run that infrastructure more efficiently by pooling users; and multi-tenancy which allows users to share an application, splitting the cost of managing that application. Yes, the 20th century went by with the great expansion of the US as an economic and political super power. What are the perspectives for the 21st century, what its role as we see China and India drive growth? The US still have an incredible opportunity, and I believe David Brooks picks well when it describes its foundation as “a crossroad” – for growth, for business development, for innovation – specifically in the IT space. It is the combination of education, venture capital, and the availability of “hubs” that define the US dominance in IT; all these factors do in fact accelerate all that is already positive, in a way that other geographies have not been able to do. This is even more true if you do the analysis in micro-segments (e.g. see how biotech, gaming, mobile are growing faster in Seattle), and see how locations determine the success of specific industries; Boston, Silicon Valley, Seattle will be the center of gravity for IT for a much longer time…. Within this picture, that shows how IT companies have very different treatment depending on where they are based, there are noteworthy exceptions – the text above is taken from a Bloomberg article where the big news is that Google paid taxes at a rate of (only!) 2.4%, by leveraging the “Double Irish” and “ Double Dutch” strategies. Nothing new there, Microsoft and IBM have been doing some of the same for a while. The scandal, if anything, is that this time we’re talking about the largest amount of tax avoidance ever, thanks to the very high contribution margin that Google enjoys in high tax countries. Now, I am not advocating that software companies do all the same, but it is inevitable to note that it is only big corporations that can afford the costs to implement these strategies. What are then the options for smaller companies, trying to be smart as they can afford to? How can you be smart in order to finance your growth plans? Given the growing opportunities that the cloud, online, telework offer, here my grain of salt: at least improve your current tax baseline, and assess the opportunities of opening an office, a subsidiary in a country that has lower taxes. Look also for specific incentives, tax breaks that may be available for IT investments. Look at the growth dynamics of each country IT spending. Hope this makes sense – but please check it also with some tax specialist! Now, whatever you do you will not avoid to pay some taxes, but it will help you challenge the fact that you have to be in a high tax situation, and limit your growth because of this. Yup, location becomes a competitive advantage. As per all this, I believe Seattle and Washington are a great destination in the US, both because of current taxes and incentives, and because of the other opportunities – specifically in games, mobile, biotech, cloud computing…. Ozzie has accomplished what he came to accomplish, right? So Mr. Ozzie is leaving Microsoft. Ozzie, who is 54 years old, "has no plans at this time". "As a company, we’ve accomplished much in the past five years as we look at the cloud and services. Windows Live now serves as a natural web-based services complement to both Windows and Office. SharePoint and Exchange have now decidedly embraced the cloud. And by conceiving, incubating and shepherding Windows Azure, Ray helped ensure we have a tremendously rich platform foundation that will enable app-level innovation across the company and by customers for years to come." What he writes is that Ozzie stood for the cloud transformation, that he was able to have Windows and Office embrace it, and that he helped change to take place. Sounds a lot, since MS is quite a juggernaut, but it could have been more – he was meant to replace BillG after all. And there is very little heart in what Steve writes. WSJ adds that Ozzie’s departure is the latest sign of turnover in MS top ranks. And adds, from a not named source, that Ozzie decided to quit Microsoft because "he has accomplished what he wanted to accomplish" at the company. 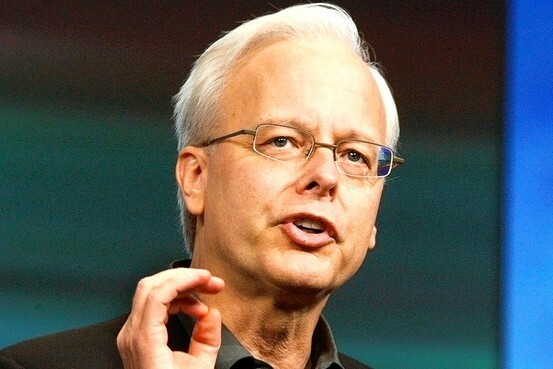 Paul Saffo (Discern Analystics): "He did more to give the company architectural discipline than anyone, Ray Ozzie more than anyone else represented someone who was dragging Microsoft’s technology into the future." Chris Nemey: "At Microsoft, (Ozzie) found himself unable to cut through turf wars and political in-fighting to make much of a mark." That would leave one to conclude that Ozzie’s absence from Redmond’s corridors won’t make any real difference at all. Well, what is sure is that the cloud strategy he developed while at Microsoft is definitely disruptive, both for the customers and for some of the product divisions themselves. The company that Microsoft was will not be in some 24/36 months, the changes and the tensions within the employee base are all about this. But when the Azure team got reorganized and joined the Server & Tools, while Live was to be a Windows environment it was a clear indication that decisions had been made, and there were different ideas on how to move forward – and Ozzie was only giving strategy but not driving it further. He was a visionary but a shy one, never a great public speaker, he was not deeply involved with customers or partners, he did not like the Corporate power plays – he did not stand up to Craig Mundie and recently to Steven Sinofsky. So, what’s next for Microsoft? Al Hilwa (IDC): "From reading the latest org chart, Microsoft has organized into multiple autonomous groups and probably has decided that its businesses are too diverse to have an overarching chief software architect". Dina Bass (Bloomberg BusinessWeek): “Ozzie’s departure fuels concerns about Microsoft bench”. On the bench there is Craig Mundie, leading the Reaserch teams; Steven Sinofsky, influential more than ever, given his ability to salvage the Windows franchise; and BobMu, who already overseas the cloud and platform investments. Will one emerge? Paul Saffo, who has known Ozzie for years, said he expects a start-up looming: "In the last couple of years, it was increasingly obvious Ray’s talents were being wasted," he said. "I’m sure he has a whole bunch of new ideas inside of him." It is very interesting to read we have a new category of funds available for investors, from the so-called “super angels”. I believe this not only offers a new opportunity for entrepreneurs, but that they really address a space which is super critical for hitech startups these days. Yup, you need in fact many Angels if each is supposed to fund you with 20-50k$; even if yes, I also understand that usually the problem with angel investors is to start the process, after the first one you will be luckier to raise the next ones. But given that the first year costs for hitech startups have dropped significantly, thanks to the availability of cheaper and scalable platforms, the need for the millions comes much later, when you maybe already in the money and look for the operating capital to finance going big. It is then very appropriate that someone is addressing the space of the 100-500k$ investments. Other comments: there are people out there that now have more than the 20-50k$ to invest, and they are not interested in investing them at the minimal rates that bond or CD offer; and there is a fresh new set of ideas coming up, while the perceived risk is lowering…. Both would be good news! Things in life happen for a reason. Look for beauty and.. enjoy!